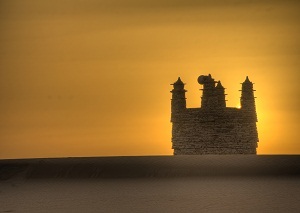 This article is a look into my time at the ancient city of Chinguetti, Mauritania. My incredible journey, including stowing away on the iron ore train, was the cover story of the latest issue of Vagabundo Magazine. If you haven’t yet, I really think you should pick it up. The story, if I do say myself, is fascinating and the rest of the issue is packed with great travel stories and photography. “Is there internet in Chinguetti?” I ask my nomad guide, Lilame. A grin creeps its way across my face as I realize that I have an excuse to put the work that I’ve been so consumed in down for a little while. I have a hard time pulling myself away from what’s happening online, and I worry sometimes that it gets in the way of my actual travels. For a day or two, at least, this should be nice. I toss my bag down on my bed and hike up to the terrace. The ancient city of Chinguetti is the 7th holiest city of Islam, and a powerful piece to the past of the once busy caravan route from Northern Africa to Mali. This was home to brilliant scholars, teachers of traditional Islam, and traders alike. Today, it still feels as if I have turned back the sands of time and have found myself with the past itself. Out in the sand gully that divides town into two pieces, a caravan of camels strolls in calling out displeasure at their owners. The old mosque begins to sound, as the call for prayer rings out throughout the city. Turbaned men wearing brown leather sandals tie the camels to palm trees before kneeling down in the desert for their midday prayers. As the sun begins to lower in the deep blue sky, I set my eyes out on the desert and the stories of an ancient mosque found in the sands. I can’t help but go and search for it. The desert sand is so soft and fine that I have trouble walking in my flip-flops, so I decide to go barefoot despite the fact that there are snakes and scorpions hiding in the sand. After a couple of kilometers – my supply of water running thin – I can see the old mosque built into the wall of a sand dune. It is one of the most beautiful sights I have ever seen. I hike up the highest dune nearby and look out on the view below as the sun sets behind the mosque. I breathe in a deep and peaceful breathe of air and exhale in satisfaction. It’s moments like this that make travel so special to me. The feeling that you have discovered something few others have seen. A moment at peace with the world with whom you are surrounded so neatly. Before the sun fully crests over the horizon I head back to the base of the dunes so I don’t lose myself out here for the night and continue my walk home. At home, I pull my mat up onto the roof terrace and squeeze myself into my sleeping bag. I look up at the stars in sheer amazement. The Milky Way forcefully creates a trail across the heart of the sky, a couple shooting stars stream through the seams, and the moon itself begins to appear over the horizon. Out here in Chinguetti, they might not have internet yet, but they have peace; and right now that peace is exactly what I need. Never in my life have I ever felt such a combined feeling of peace and harmony with the world. And, hopefully, I can bring that sense back with me to the modern world when I return to it. What STUNNING photographs! I’ve never heard of this place before – it looks incredible. I ADORE that silhouette photo of the minaret! Nice post! Thanks Chrystal – If I could go back to one and only one place in all of Africa so far it would be here! These are the kind of places I look for, the ones I strive to see before they disappear. I had never really considered traveling to Mauritania before, mostly because I know very little about the country. Thank you for letting me discover another magical place. My Pleasure Simon – I’m fairly sure you wont find nicer people in the world than you’ll find in Mauritania. In Chinguetti, it feels like you’ve gone back in time… but the people, it’s the people that made this place for me. Great post and beautiful pictures, hope you are able to bring the peacefullness back with you. TThanks Nat! I definitely did, it was such a refreshing experience. Amazing story! Very inspiring and your photos are beautiful. I would love to travel there. I had only heard a few things about Mauritania before this post. Thanks Megan – It was an amazing experience. I really think more people need to get to Mauritania. I have met countless people saying they have skipped it because they thought it was too dangerous. Hillarious really, probably the safest place in western Africa at the moment. Thank you dear Van son really so amazing pictures and am so happy that you like my country that many people dont know about. Mauritania is really a different experience. looking forward to welcoming you again. I am Mauritanian by the way living now in Korea. i READ YOUR ARTICLE AND LIKED IT SOO MUCH.